As posted at Inside Halton, January 14, 2015. The volunteer-run charity Sleeping Children Around the World (SCAW) began in 1970 with the distribution of bedkits in Pune, India. At that time, 50 bedkits, which consisted of bedding and life-saving mosquito netting, were handed out to impoverished children. Forty-five years later, the organization launched by Murray and Margaret Dryden has raised more than $23 million for bedkits — at $35 per kit — which have been distributed in more than 30 countries. More than one million children have received personal bundles to date, and the number of destitute kids around the world who benefit from the comfort of a bed, and an effective tool against deadly malaria, keeps rising. 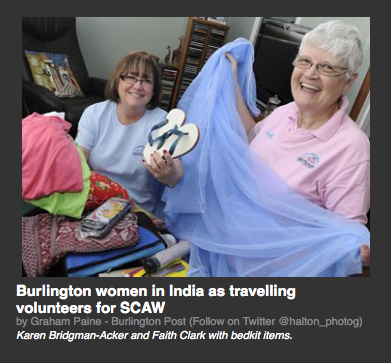 As a new year begins, another 4,000 kids — in the Indian city where it all began — will receive bedkits through a SCAW distribution trip to Pune and two Burlington women will be there. Karen Bridgman-Acker and Faith Clark are two of the six volunteers travelling to the city, located southwest of Mumbai, where they will distribute 800 bedkits on each of five days. During their two-week trip (Jan. 14-22), they will be traveling into some of Pune’s poorest areas accompanied by local Rotarians, one of the service clubs, church groups and charitable organizations that have partnered with SCAW. These local volunteers are responsible for purchasing items for the bedkit, selecting the recipients and organizing distribution sites. After the essentials of bedding and netting are purchased for every bedkit, the remainder of the $35 is spent on items such as clothing and school supplies, with needs varying from country to country. “The donor is guaranteed that 100 per cent of their donation goes to the children,” so all of the $35 is used, added Clark, who has participated in distribution journeys to Honduras, Bangladesh, Mumbai and the Philippines. SCAW is totally volunteer-based, one of the main draws for Bridgman-Acker and Clark. No one is paid a salary and travelling volunteers pay their own way. The retired teacher was introduced to SCAW when others donated bedkits on her behalf. Having participated in teacher training programs through the Canadian Teachers Federation in Nigeria and Belize, Clark thought SCAW was a good match for her, especially with her fondness for travel. “I call it travel at its best,” said Clark. Bridgman-Acker happened to read a story about SCAW and was impressed not just with the charity’s lack of administrative fees in its cost structure, but the tremendous good resulting from small individual donations. “Thirty-five dollars is so within reach,” added Clark. Despite a career as a social worker, nothing could prepare her for the destitute living conditions she witnessed, said Bridgman-Acker. will be driven to different villages, usually schools — the farthest one 135 kilometres away — to distribute bedkits, one of about a dozen such supervised trips this year. Both women have fond memories of the children’s faces upon receiving their bedkits. “But they come in singing and dancing, smiling,” said Clark. When in Kenya, Bridgman-Acker marveled at the children who walked 10 miles from their homes to the distribution site and with the bundles balanced on their heads, turned around and walked back. Experiencing firsthand the realities of life in these desperately poor countries and the opportunity to make a difference keeps them involved. “I do feel it does make a difference. I know there’s thousands and thousands of kids who won’t get a bedkit this year but there are 4,000 that will, and then next year there will be another 4,000,” said Bridgman-Acker. On each of the five distribution days, volunteers rotate jobs, sometimes taking photos of each child with their bedkits for the purposes of sending to each donor, other times handing out bedkits to the children. Clark and Bridgman-Acker also will write live blogs of their trip and an article for an upcoming SCAW newsletter. They, as well as all travelling volunteers, are also available to give presentations. Clark, who has done numerous presentations to promote the organization and raise funds, said the photos shown usually speak for themselves. While in India they expect to tour the site where outfits for the bedkits were made. While Clark comes homes after the two weeks, Bridgman-Acker’s husband is meeting her in India where the couple will continue their travels. To follow the volunteer blogs or find out more information about SCAW, visit www.scaw.org.